Shoshana Meira Friedman, center, her father Lev Friedman, left, and fiance Yotam Schachter. In Yiddish, the word “beshert” means something or someone preordained. Jewish singles talk of searching for their “beshert,” or soul mate for life. 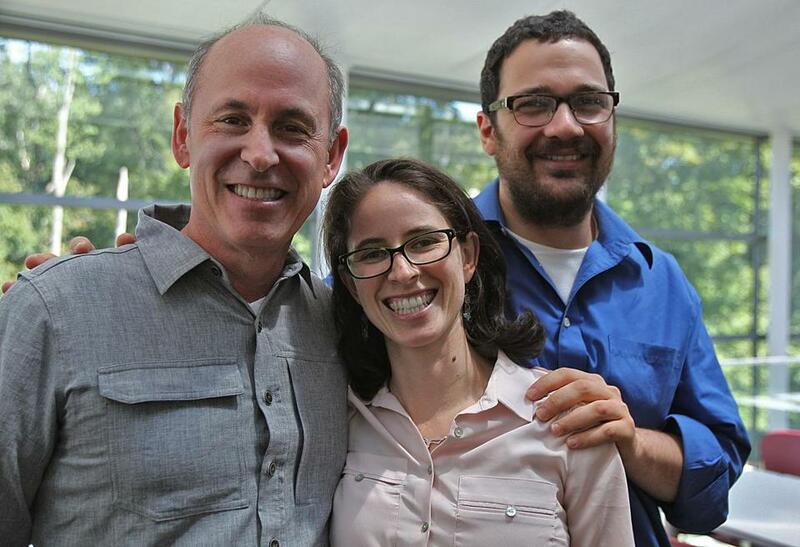 A trio of rabbinical students — Lev Friedman, 63; his daughter Shoshana Meira Friedman, 31; and her fiance, Yotam Schachter, 28 — at Hebrew College in Newton embody the word in both of its meanings . Shoshana finishes her studies in the spring. The two men — “young pups,” she calls them — are just starting the five-year program. Together, they exemplify the diversity of the 55 students in the college’s decade-old rabbinical school, the only accredited institution that is open to all streams of Judaism. How all three wound up on the same campus and in the same program is a story that began 35 years ago, when Lev, then a young folk singer, attended an evening of Hasidic storytelling in Jamaica Plain. The main attraction was Zalman Schachter-Shalomi, a Polish-born rabbi who had set out to reinvigorate Judaism. “I had been searching, as many in my generation had, for some kind of spiritual connection to Judaism,” said Lev, “and I found that through Reb Zalman.” Ordained as an Orthodox rabbi in the Chabad Lubavitch Hasidic community, Schachter-Shalomi founded Jewish Renewal, a movement that blends progressive, egalitarian thinking with centuries-old Jewish wisdom and practices of chant, dance, meditation, and mysticism. Schachter-Shalomi — or Reb Zalman, as he is widely known — also happens to be the father of Yotam Schachter. But it wasn’t through their fathers that the young couple met. Rather, some might say, they were brought together by divine intervention; more on that later. Reb Zalman helped Lev find Jewish Renewal teachers in the Boston area. Within a couple of years, he and his wife, Joyce, were organizing their own services. After first meeting in people’s homes, the swelling congregation rented halls. It took the name B’nai Or (Children of Light), and in 1982 — two weeks after Shoshana was born — drew several hundred people to its first Rosh Hashana service. The guest of honor was Reb Zalman. “He empowered me . . . to be the community leader,” Lev said. Lev remained at the helm of B’nai Or until 1996, when he stepped down due to the demands of his day job. He had become sole owner of Kolbo Fine Judaica Gallery, a Brookline shop that carries artwork, crafts, ritual items, and books. Lev calls Kolbo his “second rabbinate.” He befriended customers as they celebrated the various milestones in their lives; as the store is near Levine Chapels, he also soothed them at times of loss. “For many people, Kolbo was their synagogue,” said Lev. B’nai Or, meanwhile, found a home at Andover Newton Theological School, where it is “aging but alive and well,” Lev said. The campus happens to be next door to Hebrew College, but his route to the rabbinical school ran through Jerusalem. Before we get to that part of the story, we need to switch to his daughter. The oldest of three sisters, Shoshana grew up knowing Judaism as “beautiful melodies and a small community sitting in a circle, and my dad with his rainbow tallis, his guitar, and just this really sweet sense of connection,” she said. She managed to cram two years of Hebrew learning into eight months, and started rabbinical school in the fall of 2008. As part of the program, she was required to study in Israel — and that’s where her father reenters the story. Lev sold Kolbo in 2011, intending to return to the music world. His plans changed, though, when he visited Shoshana in Jerusalem. Joining in one of her study sessions, he felt a surge of excitement when he recognized a Biblical passage that he had taught as leader of B’nai Or. “We both said at the same moment ‘mekorot,’ ” Lev said, referring to Hebrew College’s preparatory program for rabbinical school. After letting the idea percolate a couple of months, he decided to enroll. Yotam, meanwhile, took his own road to Hebrew College. As a teen he began drifting away from Judaism and his father. “He inspired me tremendously and filled me with a lot of questions,” Yotam said. He wondered, for example, why he needed to be Jewish if the search for truth is universal. But while at the University of Chicago, where he studied math and philosophy, Yotam underwent what he called “a spiritual awakening.” He wanted to connect to that energy, but couldn’t figure out how. By the time he graduated from college, Yotam said, he knew he wanted to become a rabbi. But he decided that he’d be more effective at the job if he got outside experience. He managed a customer service department for three years, spent a half year traveling the country, and then enrolled in a massage school, which equipped him with both marketable and pastoral skills. Yotam took courses at the same Conservative yeshiva in Jerusalem that Shoshana would attend the following year, and he studied as well with his father. After deciding to enroll at the Newton school, Yotam moved to the area and began practicing massage therapy. On his third day in town, he attended a service at Hebrew College, where he saw Shoshana. They had talked once at a retreat a few years before, but this time the stars were aligned. “We fell in love immediately,” Yotam said. They plan to wed in June. Shoshana had known of Yotam’s dad as the rabbi who had inspired her own father. While Yotam didn’t know Lev by name, he did recall his father mentioning “this guy in Boston who was ordained from below” — meaning unofficially, by his congregation. After she’s ordained (from above, that is), Shoshana hopes to work for a congregation in the Boston area until Yotam completes school. “An ecological component would pervade anything I do,” she said. After Yotam graduates, the two intend to work together. “We very much share the vision that Judaism as a practice can help people be better local and global citizens,” he said. As for Lev, he’ll be 67 when he’s ordained — plenty young enough to launch his third rabbinate.